The Students’ Union at Bournemouth University (SUBU) works hard to improve your student experience whilst at BU. Our vision is "to have a positive impact on every Bournemouth University student's journey". As a registered charity led by our values and guided by our students, we do this by providing wide-ranging services and support to the 18,000 students at BU. SUBU's main offices are based on the Talbot Campus. SUBU has a £3m per-annum turnover and employs approximately 150 full and part-time staff. Good luck in your job applications! SUBU has been awarded stage 2 of the Investors In Diversity, as a member of the SUBU Democracy and Equality department, you will focussing particularly on ‘non-traditional’ students, the Inclusion, Retention and Success Coordinator will work closely with BU and SUBU staff to analyse reasons why some students do not currently engage more in their student experience and why some of them end up leaving University before they complete their degree. Acting on this analysis, you will devise and deliver activities and interventions to increase effective sustainable student engagement. Primarily this role will also focus on the BME attainment gap and dropout rate; and working with the relevant Officers in coming up with the right strategies to address any concerns. Ideally, you will be passionate about helping people overcome barriers and succeed in their lives, and you will have a proven track record of taking ideas from concept, through planning, to effective delivery. You will be comfortable engaging with a wide range of people in different situations, taking on board suggestions from others, and then working on your own initiative to deliver your objectives. You will be motivated by the thought of working closely with students, helping them to achieve their goals, and being satisfied in seeing them realise their potential. The prospect of getting your hands dirty and helping others in the organisation will also make you happy. Open, honest, trusting and flexible, you will be happy going the extra mile to help people as a normal part of your approach at work. All this will mean that SUBU and its culture will be the ideal place for you to work. The Students’ Union at Bournemouth University (SUBU) is a registered charity that is seeking to have a positive impact on every BU students’ journey, student representation is at the core of that mission. SUBU is nationally renowned for our work in student representation and is highly regarded within the field, and we have an exciting opportunity for a new addition to our representation team. We are looking to recruit an enthusiastic character that is passionate about student representation within higher education. This person will be a key contact for over 700 Student Reps so will need to have the ability to excite students about representation and the benefits it has. They will also need to be driven about the impact that student feedback has within the institution. If you think this is you then get in touch. If you would like to talk to us about the post, please feel free to do so – you can call Kerry Dean, Representation Manager, on 01202 965771. Interviews will be held on 30th/31st August. The Community Warden role is based mainly off campus in the community; working pro-actively towards making the local community a safer, cleaner and ‘greener’ place for all residents and foster good relations between the student and non-student residents. You will also be expected to patrol designated streets, speaking to all student and permanent residents and posting information leaflets. You will also attend regular meetings, with SUBU, and BU, relevant to the post. You will take an active interest in student and non-student residents within your area, and encourage a culture of community. Why become a Student Community Warden? If you are a Bournemouth University student with a passion for improving community relations, excellent inter-personal skills, and would consider yourself to be self-motivated with the ability to use your own initiative, this could be ideal for you. Flexible hours, working around your other commitments. Gain knowledge and valuable community relation skills. A positive addition to your CV. Between now, and the end of May depending on how quickly you get your application to us. Interviews after 1st June may be held over the telephone. If you have any questions feel free to email communitywardens@bournemouth.ac.uk. From national club nights and student led raves through to up and coming touring bands and comedy shows, The Old Fire Station has something for everyone. We have a team of students staff who run the venue under the watchful eye of the full time manager team. Most of our shifts are evening based, you will be expected to do 2 shifts per week on average, with some at weekends. We are looking to recruit part time staff from students at Bournemouth University and AUB for the following positions. Bar Staff – Serving customers behind the bar or in the Box Office. Successful recruits will enjoy working in a fast paced, high energy environment and have a passion for events and great customer service. You will love serving drinks and have a competitive side to your character. Technical Crew – Setting up the technical side of events, running sound / lights and making the venue look great. Events would not happen without a 'Tech Crew' working behind the scenes. You will need a technical aptitude, organised approach to work and can do attitude. Promotional Staff – Networking / Postering / flyering. We need a passionate team of students to be our key promotional people. You will be hard working, pursuasive, probably bit of a natural leader and love talking to people. We do have some work available during the University vacations, but this is in addition to your normal work and not compulsory. SUBU Student Shop: This is a busy convenience store on Talbot Campus. It is hectic and we require lively people who have a good rapport with customers and able to work within a team as well as being able to motivate themselves to work on their own. The majority of the work will involve serving customers on checkouts and replenishing stock. This role will also include some lifting when unpacking deliveries. SUBU Student Centre Ground Up Cafe: - A cafe (Starbucks) outlet in the Student Centre, Talbot Campus, that is extremely busy. Counter staff: We are looking for experienced Baristas, preferably with coffee chain backgrounds, as well as people who have had no experience at all. The work is fast paced so you need to be quick and a methodical work style. The role involves making coffee, taking orders at the till, serving and heating food as well as keeping the service area clean and tidy. You will be working as part of a large team, along with the kitchen staff and a Student Duty Manager. Kitchen staff: The Student Centre kitchen prepares food for Ground Up Cafe and the Student Shop. You will be preparing Ciabattas, Salads, Burritos, Sandwiches, Wraps etc as part of a small team or occasionally on your own. Dylan's Kitchen & Bar: the lively bar on Talbot Campus. Bar staff: it is preferred that you will have had previous bar experience, although this is not essential. You will need to be able to motivate yourself when it is quiet, work as part of the team when it is busy, and be able to interact with the customers in a fun and professional way. Duties include serving customers, clearing tables, serving food, and using the pot wash. Kitchen staff: the kitchen in Dylan's is busy and serves food to order. Burgers and chips are our biggest sellers, as well as home prepared pizza, and nachos. We need people who can work efficiently in this challenging environment with a thorough clean and tidy manner from start of service to clean down at the end of day. The Dylan's team works as a team, and so we expect both bar and kitchen staff to be prepared to help each other out. 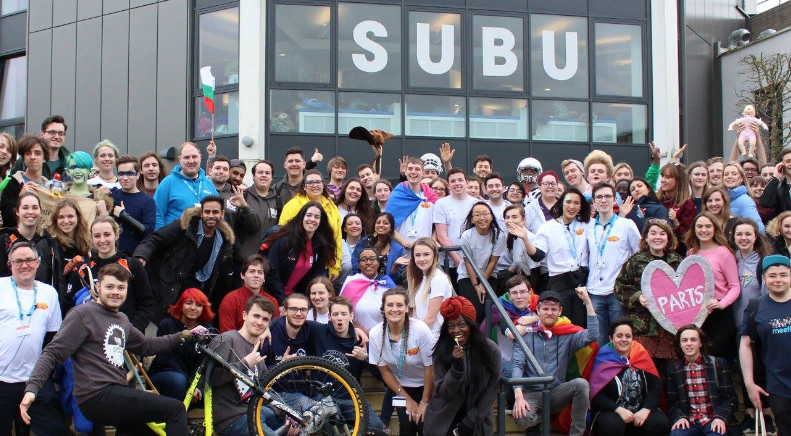 SUBU is looking to recruit students to work for us helping us maximise the impact of our activity and events. Complete an induction with each department of SUBU so you understand the different functions of the organisation. This team will largely work on SUBU’s activities such as democracy, clubs & societies, representation, campaigns, meetings, marketing promotions. There may be occasions when you are asked to be part of a larger team that encompasses all of SUBU (e.g. Fresher’s Fair). We will attempt to be a flexible as possible with shift patterns to accommodate your lectures or workload. We are looking for three BU students to join the Advice Crew. The SUBU Advice Crew help plan and deliver the preventative activities hosted by SUBU Advice. These include Advice on Tour, Money Matters and Am I Ready to Rent, to name a few. Advice Crew triage enquiries during student interactions providing face-to-face information and signposting to BU support services and external support service. Successful candidates will help students understand their rights and responsibilities in relation to housing, money and academic related issues and be able to work within professional boundaries as part of our confidential service. Successful candidates will work on both sites and, on occasion, in halls or residence. Please refer to the job description and person specification when completing the application form.